SAN DIEGO — Responding to an average of nearly one waterfront fire per week, the Port of San Diego’s Harbor Police Department is trained to immediately respond to and contain emergencies. The Harbor Police Department is the only law enforcement agency in San Diego County that dually trains its members as police officers and marine firefighters. In order to become a Harbor Police officer, 120 hours at the department’s in-house Marine Firefighting Academy is required, in addition to police academy training. 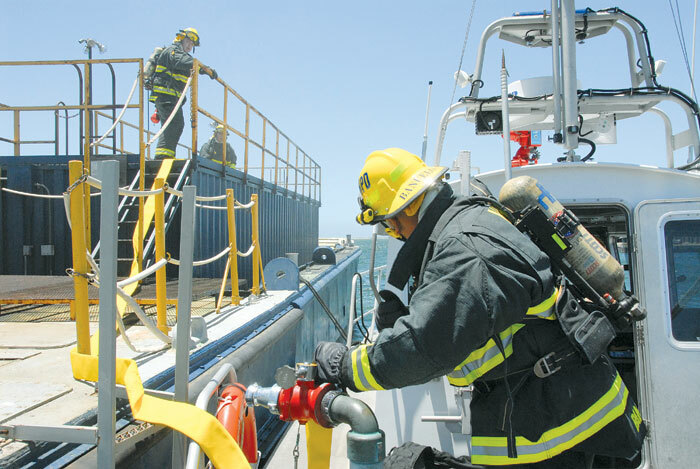 Part of the officers’ firefighting training is conducted on a fire training vessel, which was renovated from a U.S. Marine Corps landing craft. This training simulates fire emergencies and is an essential part of the firefighting academy. Fires aboard the training vessel are ignited by a control panel that regulates a propane-fueled fire. Firefighting instructors are able to control the level and intensity of the fire at all times. In preparation for fighting fires aboard the training vessel, or for real fire emergencies, Harbor Police officers require specialized protective gear that weighs between 60 to 70 pounds. This gear includes approximately 28 pounds of protective clothing that is composed of pants, boots, coat and a helmet; a 30-pound air pack; and a 15-pound ax or halligan bar that is carried. The officers are trained to change into their firefighting gear in two to three minutes, and the protective gear allows them to withstand temperatures of 300 to 400 degrees for as long as 10 minutes. The gear can even handle 1,100 degrees of heat for several seconds. Powerful, well-equipped Firestorm police boats are the most recent addition to the department’s public safety arsenal. They enable officers to respond more quickly to emergencies and apply more water or firefighting foam than previous vessels. “It has all of the same basic equipment that any engine our member city fire departments have,” Scheil said. “The beauty is that we take the fire hydrants with us. We pump the water straight from the bay, so we don’t ever have to worry about water supply.” Harbor Police officers patrol 22 square miles of water around the clock at the port’s five member cities: San Diego, Imperial Beach, National City, Coronado and Chula Vista. Harbor Police officers patrol the bay to protect the public from drug trafficking and other criminal offenses, and to respond to fires and other emergencies. They are part of the network of local and federal agencies that are on alert for homeland security threats through the Joint Terrorism Task Force. The Harbor Police Department’s specialized forces also provide mutual aid to lifeguards in Mission Bay and harbors in neighboring counties. While all Harbor Police officers are marine firefighters, there are also specialty units within the department. They include the dive team, the bike team, the traffic team, the K-9 team and the investigations unit.